Tolgan, a Nord, is herald to Countess Narina Carvain in Bruma. If you visit the city and your fame is at least 10, he will seek you out to inform you that the countess requests your presence. This is the beginning of the Lifting the Vale quest. Life as a steward in Castle Bruma is an easy one; Tolgan sleeps behind locked doors in the central part of the Lords Manor every night between midnight and 6am. After waking up he immediately heads down to the Great Hall, where he will spend the rest of the day wandering around, advising potential visitors and just be there if the Countess needs him. He only takes a break at 4pm when he enters the Lords Manor and enjoys an early two-hour dinner, before he returns to the Great Hall where he strolls around until midnight. The only time he breaks off from his routine is when you arrive in Bruma with a fame of ten or above, when he will actively seek you out and deliver a special message from the Countess herself. He wears middle class clothing: a quilted doublet, tan linens and a pair of doeskin shoes. He is armed with a steel shortsword and carries the Bruma Castle key and a small amount of gold. Whenever you get near him, Tolgan will say: "Well met, milord/milady." If you talk to him with a fame lower than 10, he will introduce himself briefly: "Good day. I'm Tolgan, herald to Countess Narina Carvain." When asked about the Countess his response will differ with the time of day: "The Countess is in attendance. Please observe proper etiquette." or "The Countess is in attendance from 8 in the morning until 6 in the evening each day. If you wish to seek audience with her, please return at that time. You're also welcome to wait anywhere in the Great Hall. Good day." If you have started the Defense of Bruma quest he will skip all his formal greetings and his dedication to the Countess' Akaviri collection and utter: "The Countess has received word from Cloud Ruler Temple that grave matters are afoot. Nothing else concerns her at the moment." 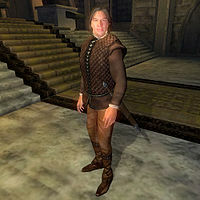 When you arrive in Bruma, without having initiated the quest but with the required fame of 10, Tolgan will actively seek you out and formally introduce himself: "Good day. I'm Tolgan, herald to Countess Narina Carvain here in Bruma. She requests your company at your earliest convenience." When you ask him to elaborate, he will once again point you towards Narina: "Countess Carvain would prefer if you speak to her in person. She also said to present you with this stipend as a taste of things to come. My Lady holds court from 8 in the morning until 6 in the evening each day. That would be the best time to see her." An alternative method of starting the quest is by talking to the townsfolk about the Countess' obsession with Akaviri Artifacts. They will then point you towards Tolgan: "Her steward, Tolgan, occasionally approaches individuals the Countess feels is worthy enough to seek her prize. If you're interested in assisting the Countess, you can always seek out Tolgan. He's usually in the Castle." Even if you know that Tolgan will hunt you down, talking to Narina will net you: "I think I know why you're here, but I'd speak to my herald, Tolgan, first. I believe he has something for you. Then return to me." With these words, she will exit conversation until you have spoken with Tolgan, who will hand you the stipend of 25 gold and repeat what he would have said if he sought you out himself. The Countess will then comment: "I trust that the stipend Tolgan gave you whetted your appetite?" then proceed to send you on your way to Pale Pass for the Draconian Madstone. If you at any time interrupt the Countess' long story, Tolgan will comment: "I'm sorry. You must speak to Countess Carvain for any further information." When you return from Pale Pass with the Madstone in hand, Tolgan will now greet you with: "Welcome back, milord/milady." but will only point you towards the Countess: "If you have the item my Lady seeks, I suggest you bring it to her. She hasn't slept a wink since you departed." After you have given the Madstone to the Countess, Tolgan will greet you with: "I've never seen my Lady so happy. You've done well." Lifting the Vale: Countess Narina Carvain wants you to find the Draconian Madstone. Although the subtitles read "The Countess is in attendance from 8 in the morning until 6 in the evening each day", the voicing incorrectly says "The Countess is in attendance from 8 in the morning until noon then again from 3 o'clock in the afternoon until 8 each day". This page was last modified on 22 June 2018, at 04:35.